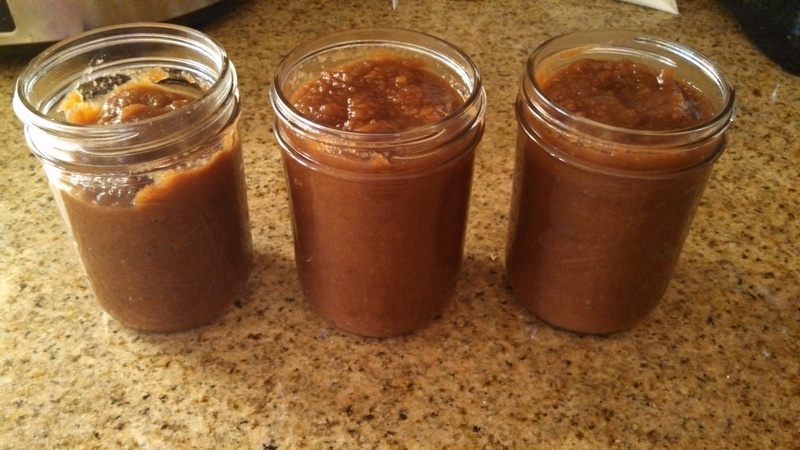 Since I haven’t had much success with making jams and jellies, I’m glad to have had success with making apple butter. Mid-October, my family made a trip to Apple Annie’s Orchard to pick apples. At that time, what they had for harvest was lots of Granny Smith and some Rome Beauty. So, we got around 8 pounds to bring home. We won’t really eat Granny Smith plain, but, with a little added sugar, we like them prepared in things. Now, mine never turns out as pretty as other pictures that I have seen, but it works out well enough for us! Normally, I wouldn’t add sugar, but with as many Granny Smith apples as I had, it needed the sugar to balance out the tart. I cooked it on low overnight, about 10 hours. 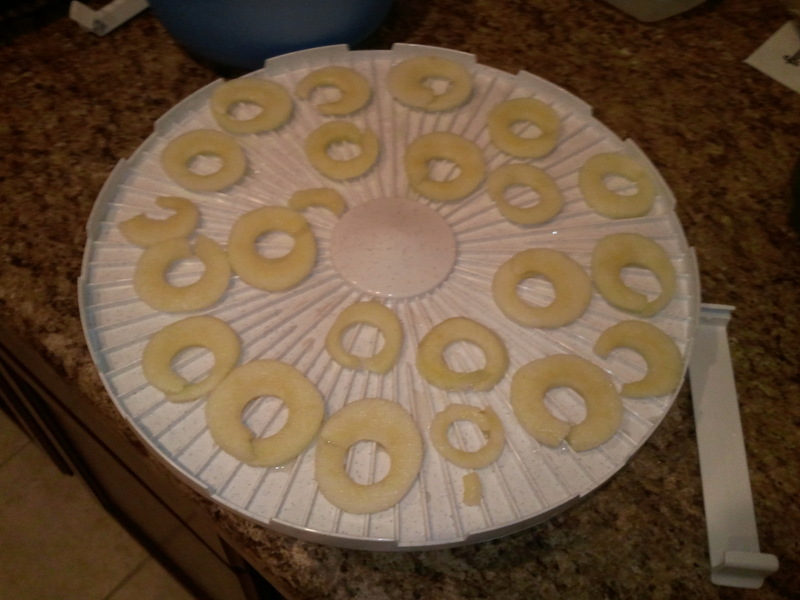 In the morning, I removed the lid and used my hand mixer to smooth out the apples in the slow cooker. I left the lid off and continued to cook it on low for another 2 hours, until it had gotten a thicker consistency. We love to eat this on toast and waffles, plus it’s a nice addition to a peanut butter sandwich instead of the grape jelly I buy at the store. It’s a wonderful fall treat! The prep takes some time and effort, but then you can let it cook all day while you work on other things. My kids love fruit snacks and roll ups, but most are so full of crap, that I don’t like to buy them. 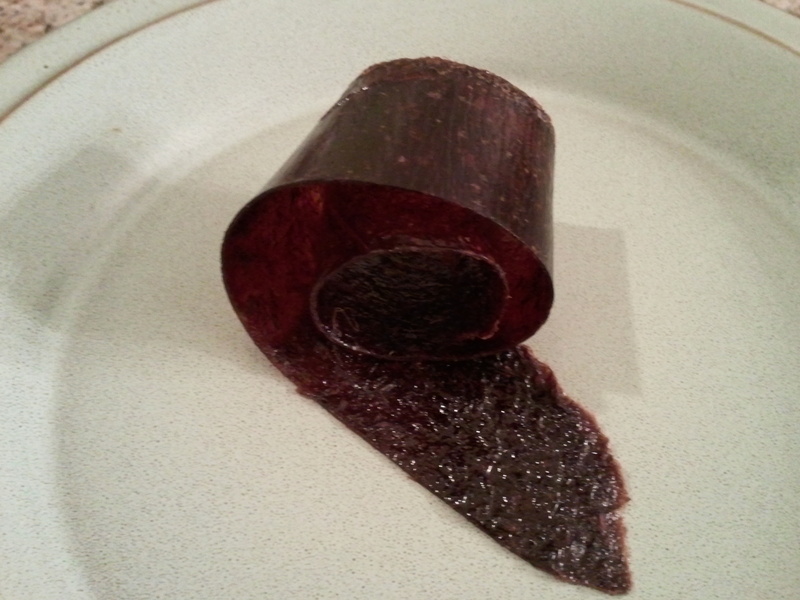 So, in trying to use up my cherries, I decided to give fruit leather a try. It was pretty easy to put together, it was just the time in the oven to dry it out. 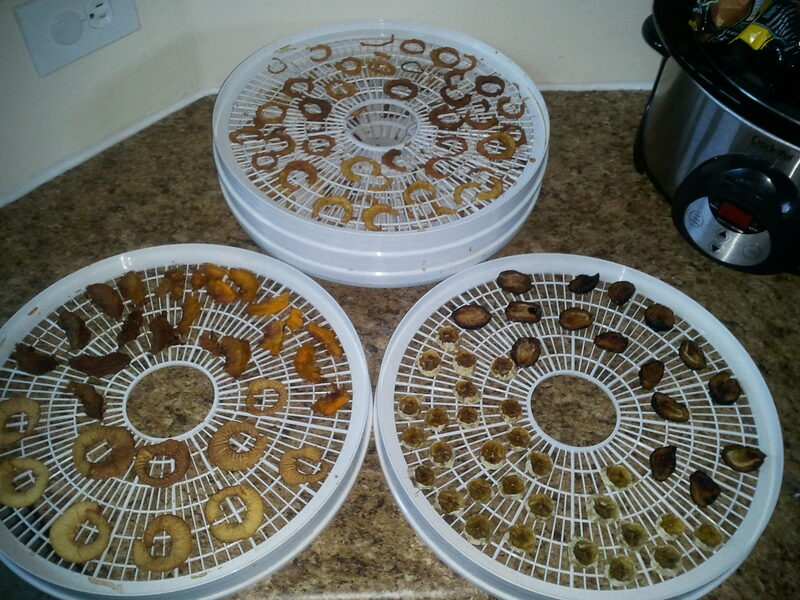 It would be a lot faster with a food dehydrator, but I don’t have one right now. I’m working on figuring out how to use other fruits to make this in the future. The original recipe I found just used cherries and also had sugar, but since I didn’t want to use sugar, I decided to use some applesauce I had in the freezer to add some more sweetness. Although, honestly, the cherries I got were sweet enough, they probably wouldn’t need sugar. If you use tart cherries, you will probably want to add sugar for sweetness, but you could probably substitute honey to give it a more natural sweetness. Preheat oven to 170 F, or the lowest setting your oven will go. 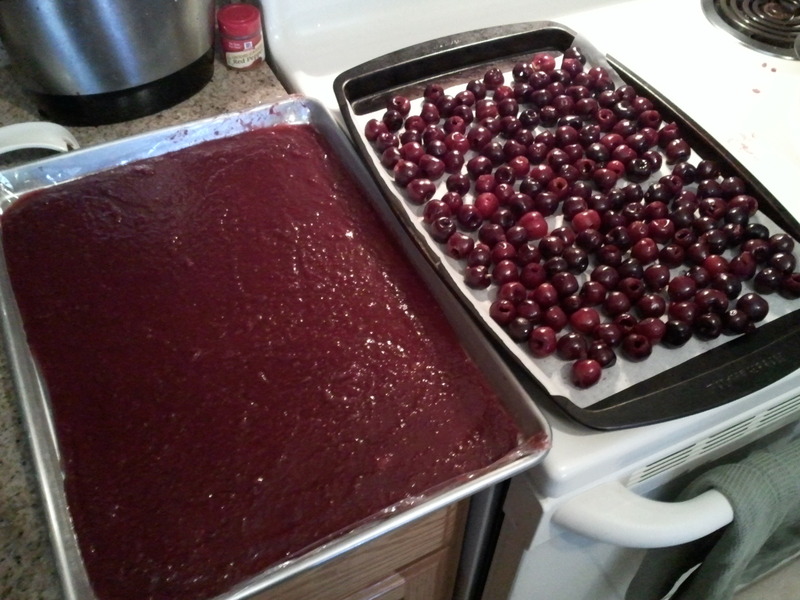 For me, this was 200 F.
Place cherries (and chopped apples) in a large pot with the water. Bring to a boil, then simmer until fruit starts to break down, about 10 minutes. Transfer to a blender to puree well, then return to the pot. Or, keep in the pot and use an immersion blender to puree fruit. Add applesauce and/or the sugar or honey, and stir well. Simmer over low heat, stirring frequently, until the mixture thickens. Line a jelly roll pan or baking sheet with raised sides with parchment paper, plastic wrap, or a silicone baking mat (I used plastic wrap). Depending on the size of your pan, you may need to use 2. Place pan(s) in the preheated oven. If using 2 pans, be sure to rotate every hour. Let sit in the low heat oven for 3-6 hours, or until fruit mixture is just slightly tacky. Remove and allow to cool. 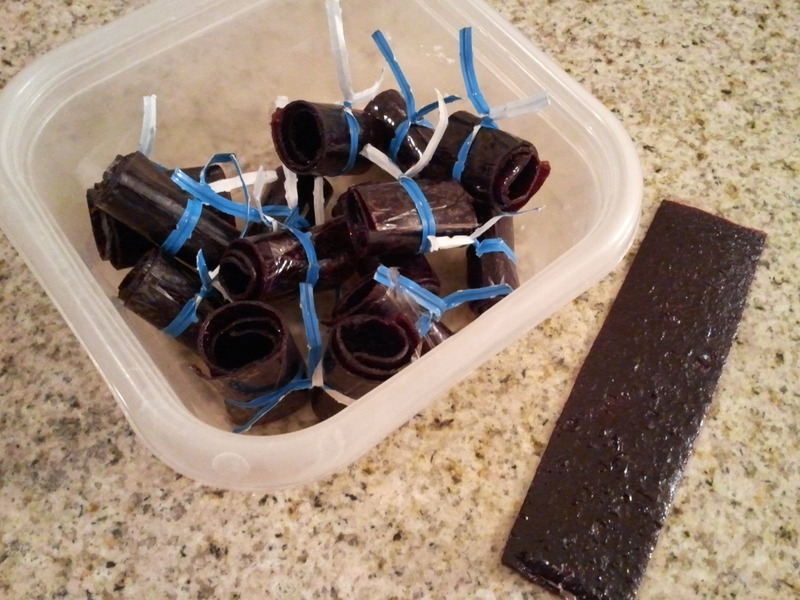 Cut the fruit leather into smaller pieces, as desired. I used a pizza cutter to make a cut in the middle lengthwise, then cut into 1″ strips. The pizza cutter cut the plastic wrap as well, so I kept it on to help prevent the roll from sticking to itself. I used twist ties to hold the rolls together, you could also use string. Store in an airtight container, and it should be good for a few weeks. When I get a lot of apples from Bountiful Baskets and I can sneak some away from my girls, I love to make Apple Crisp. I actually hadn’t made it before last year, so I didn’t have a recipe. Thankfully, after reaching out to friends for a recipe, I got one that was exactly what I as looking for. 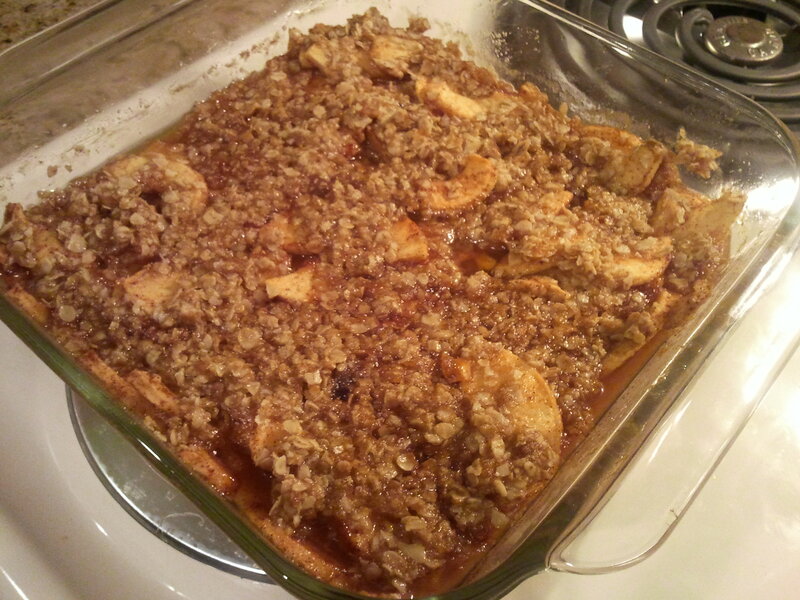 Thank you to Joshua W. for sharing your grandmother’s Apple Crisp recipe. I love it, and everyone I’ve made it for or who has made it as well, loves it too. Next time we get apples in Bountiful Baskets, a friend and I will be working on a gluten-free version of this, which, if we get it to work, I will share as well. Note: I sometimes like more crumble on top, so I will double the topping ingredients. Combine the ingredients for the filling and place in a 8×8 or 7×11 baking pan. Cream together the butter and flour for the topping. Mix in the brown sugar and oatmeal and form “crumbs” with your fingers. 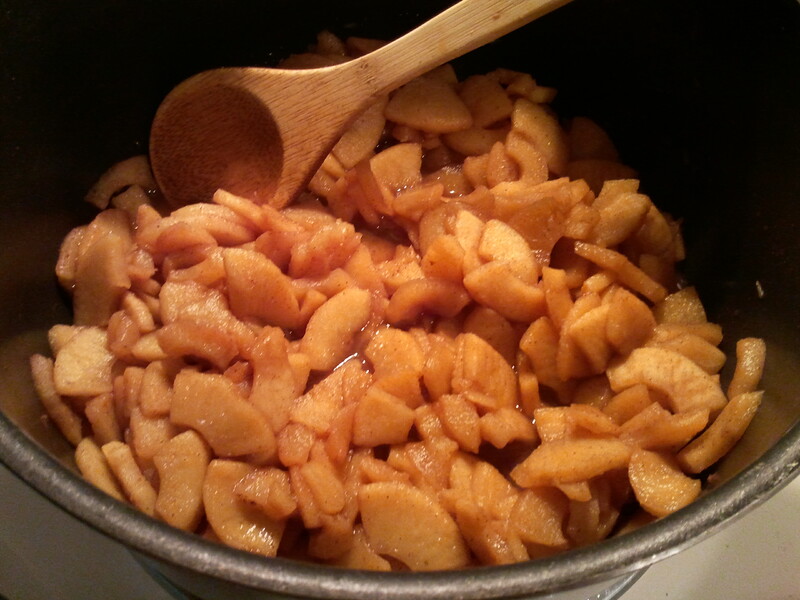 Spread over the apple mixture. Bake at 325 F for 30-40 minutes. Let cool slightly, and serve warm. Or it tastes great cold from the fridge the next day too…if it lasts that long! Last year, I split a couple cases of apples from Bountiful Baskets with friends. With some of the apples, I made homemade applesauce, which both of my kids enjoyed. Recently, there was a case of fuji apples available, so I ordered it and split the apples with some friends. Then, we moved, then I broke my glass blender pitcher (a very sad day), so applesauce got put on hold. 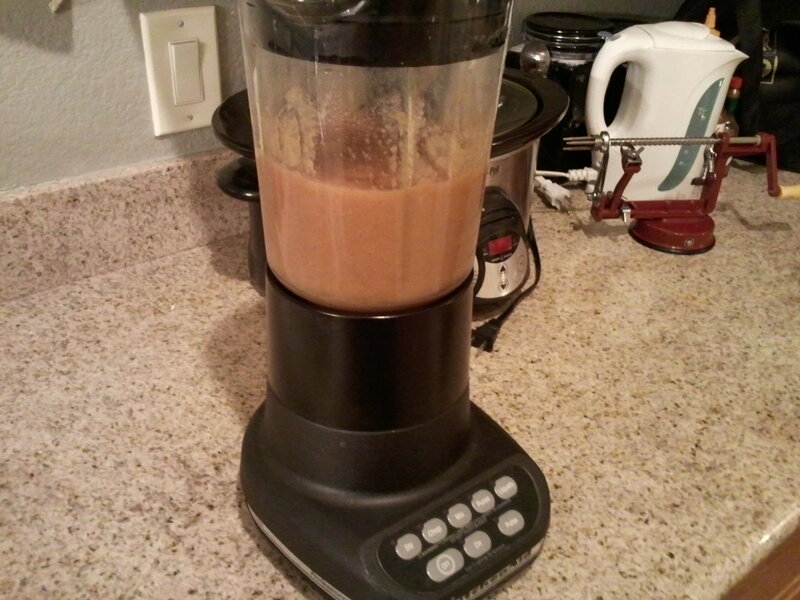 I was able to get a very similar blender this week, and the apples are still good to go, so it was time to make applesauce. Wash, peel, core and slice the apples. 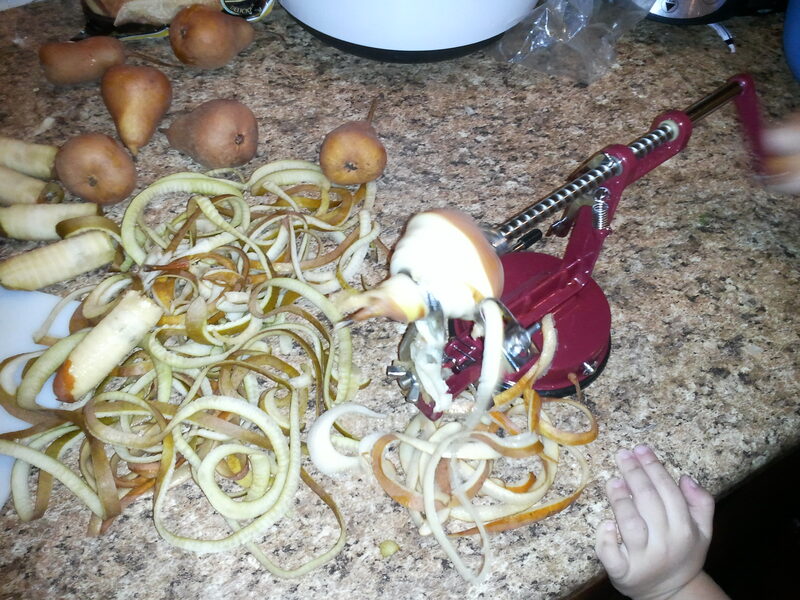 I have 2 little helpers who love getting to wind the apple peeler/corer/slicer we have. 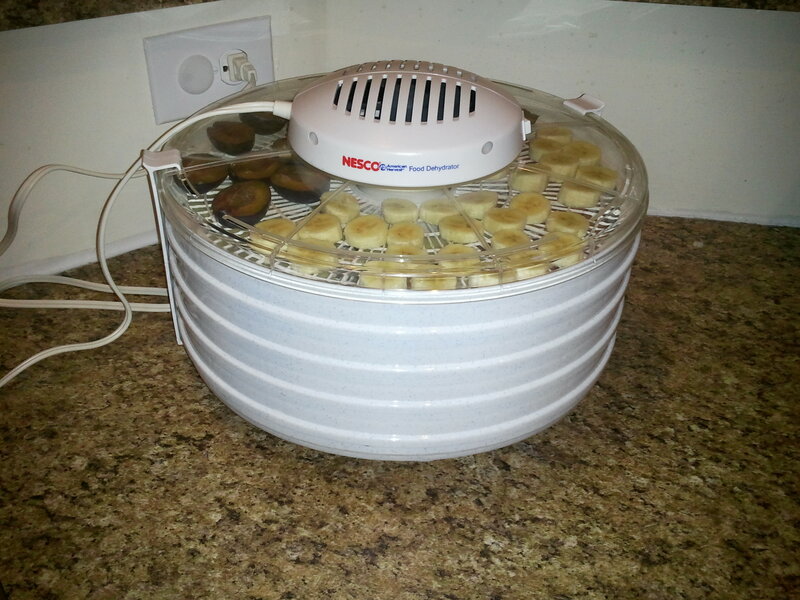 This invention makes the whole apple prep process go pretty quick. It makes the apple into a sliced spiral, which I then cut into fourths. Add the sliced apples to a large pot, along with the water and cinnamon. 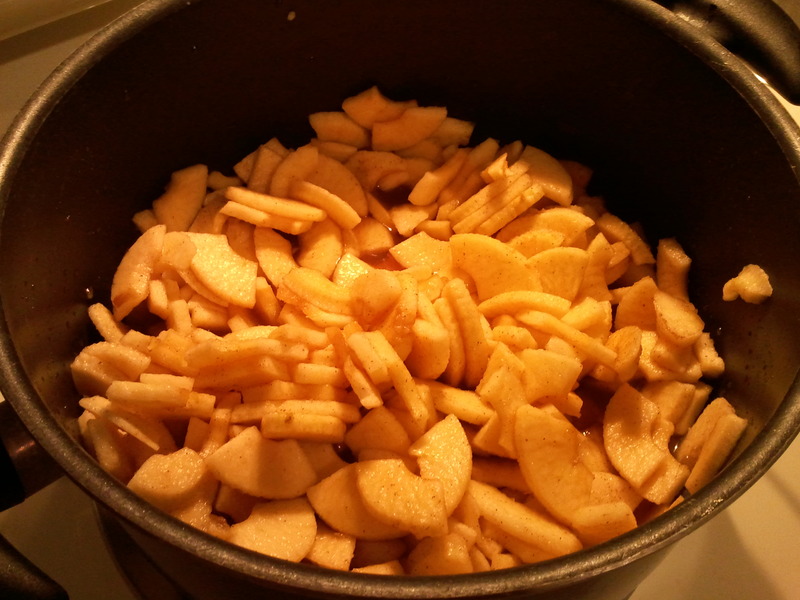 Bring to a boil, then reduce heat to simmer for about an hour or so, until apples are nice and mushy. 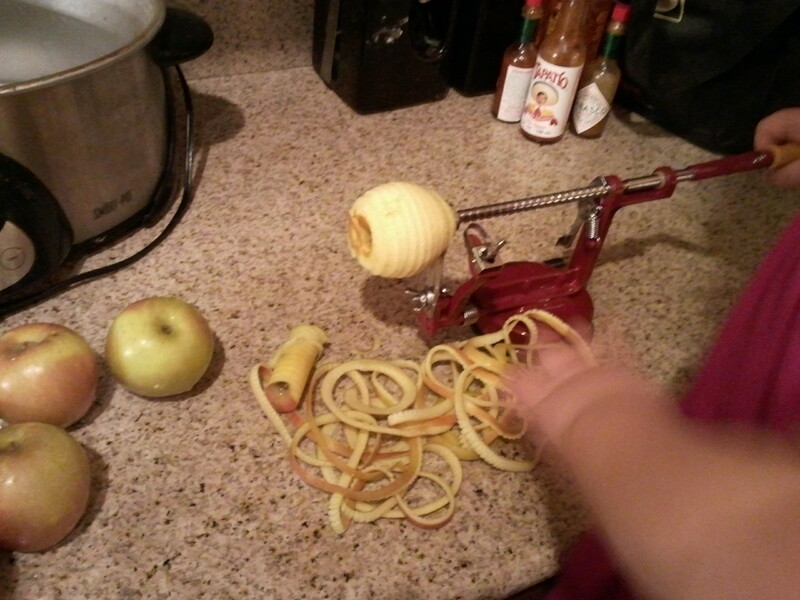 Pour cooked apples into a blender or food processor and puree until smooth. My new to me blender worked perfectly for this. Then, serve or put into containers of your choice. 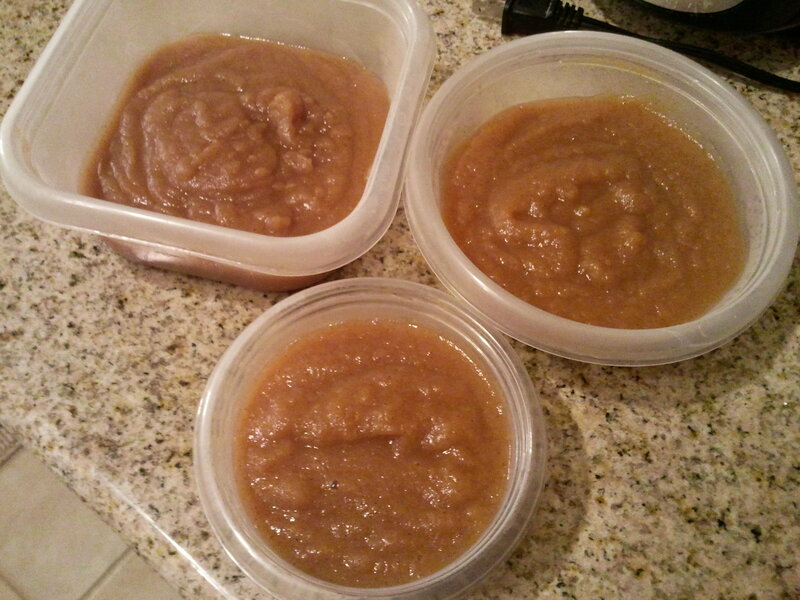 This made 3 cups of applesauce, so I put 1 cup into each of the 3 containers that I had on hand. My kids were already in bed by the time this was finished, but it will be a nice addition to breakfast or a good snack!